Enjoy Silverado’s two 18-hole PGA courses and save up to 30% on room and green fees. Save up to 30% on your room and green fees with this special package. Enjoy one full round of PGA golf per person per night; play for free after 2 p.m. the day you arrive; and enjoy unlimited use of our practice facility, range balls, and club storage service. Sunday departures receive complimentary late check-out until 2 p.m. (based upon availability). The Golfer’s Dream is based on double occupancy – for each additional guest, there will be an additional cost. Rate does not include taxes, gratuities, or a nightly $25 resort fee. Not applicable to group or wedding attendees. Cannot be combined with any other offer or discount. Non-retroactive rate. Unused package components will not be refunded. Cancellation Policy: 7 days prior to arrival to avoid a charge of one night's room, tax, and resort fee. Early Departure Policy: Guests who depart prior to the confirmed reservation end date will be charged the last night’s room, tax, and resort fee. 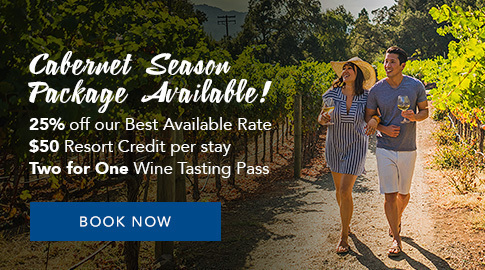 Put your golf skills to the test and play Napa Valley's only resort with 36 holes of PGA championship golf, home of the Safeway Open PGA Tour. Our Silverado Experience - Stay and Play package includes staying in a two bedroom suite for three nights, two rounds of golf per person, a delicious daily breakfast in The Grill, one 50 minute Silverado signature spa treatment and a golf amenity per person. All this starting at just $360 per person per day. All packages are subject to availability. This package is based on a minimum of four people. Rate does not include per night taxes, gratuities, or resort fee. All recreational amenities, including golf, are weather permitting, with no rain checks. Not applicable to group or wedding attendees. Cannot be combined with any other offer or discount. Non-retroactive rate — prices subject to change without notice. Unused package components will not be refunded. Minimum three-night stay required.